This recipe marks my first experience with parsnips, and it's a decent one. 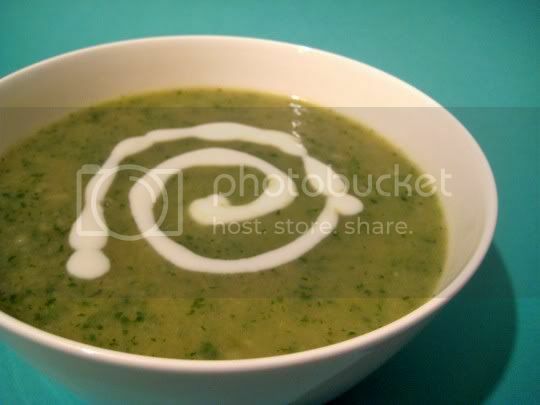 The parsnips (which are closely related to the carrot) contribute heavily to the flavor of the soup, even seeming to mask out the spinach. The flavor is hard to describe, but here goes: light, sweet, herbal, almost perfume-like. I would also say there's a slight metallic undertone, but maybe it's just the combination of the onions, celery, and spinach. Other than that, there's not much to this soup! Vegetable bouillon cubes are added for spices and salt, and a dollop of plain yogurt is added on top which does add in a little extra creaminess. The pureed soup already has a creamy base, considering there's no dairy in it...but it's because of the parsnips! Such an interesting vegetable! Overall, this is a light, sweet dish that would go very nicely with something tangy or acidic, like a tomato-based dish. Make again? Maybe, if I were in the mood for something different and unusual. Parsnips, I guess you either love 'em or hate 'em.